Sue Lawley's castaway is Bishop of Birmingham Bishop John Sentamu. 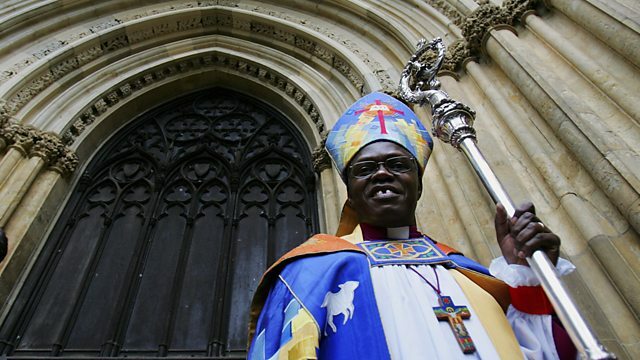 Sue Lawley's castaway this week is The Bishop of Birmingham, John Sentamu. When John Sentamu was born, the sixth of 13 children, near Kampala in Uganda in 1949, he was so small the local bishop was called in to baptise him immediately. He survived his birth, a sickly childhood and a famine to become, a mere 25 years later, a judge in the Uganda High Court. In 1974 he managed to get a visa to leave Uganda and come to Britain where he studied theology with a view to returning to the Ugandan justice system at the end of his studies. However, when his friend the Ugandan Archbishop Janani Luwum was murdered he vowed "You kill my friend, I take his place", and he was ordained in 1979. He served in parishes in Cambridge and London, and was vicar of Holy Trinity Church in South London for 13 years during which time he raised £1.6 million to restore his church and its organ as well as increasing his congregation tenfold. He is now the Bishop of Birmingham, and one of only two senior bishops from ethnic minorities. He was an advisor to the Stephen Lawrence Judicial Inquiry and the Chairman of the Damilola Taylor Review board. The Music of St Paul's Cathedral. Les introuvables de Jacqueline du Pre. Thank You For The Years.